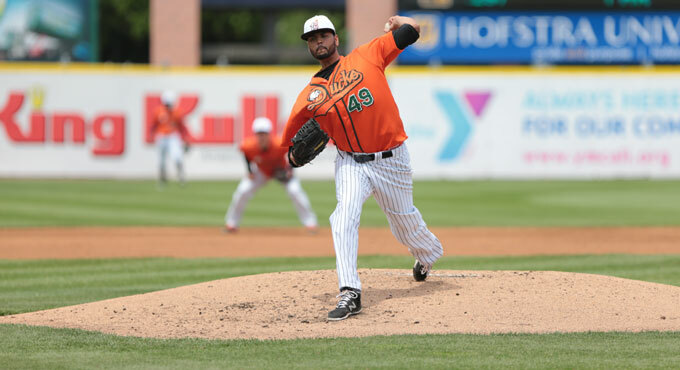 (Central Islip, N.Y., July 9, 2015) – The three-time Atlantic League champion Long Island Ducks today announced that left-handed pitcher Andrew Barbosa has been signed by the Atlanta Braves organization. He will report to the team’s Double-A affiliate in Mississippi and is the Ducks’ seventh player signed by a Major League Baseball or foreign organization this season (Bobby Blevins, Taiwan; Kevin Vance, Diamondbacks; Trayvon Robinson, Diamondbacks; Mike Blanke, Red Sox; Hector Ambriz, Nationals; Mickey Jannis, Mets). He also becomes the 77th Ducks player signed by MLB all-time. Barbosa made nine starts this season with the Ducks, posting a 4-1 record and a 2.82 ERA. In 51 innings of work, the southpaw struck out 59 batters while walking just 19. He allowed just one earned run in his first four starts of the season (22 innings pitched) and gave up only one run in six of his nine outings. In addition, the 27-year-old struck out 10 batters in back-to-back starts on May 30 and June 5 and collected five or more strikeouts in each of his last seven starts. The Florida native began the 2015 season in the Arizona Diamondbacks organization with Double-A Mobile, making three appearances (one start). In 2014, he split time between Rookie-level AZL Diamondbacks and Advanced-A Visalia, combining to go 7-2 with a 3.64 ERA in 20 starts. His efforts earned him midseason All-Star honors with Visalia. Barbosa was drafted by the Diamondbacks in the 36th round of the 2012 amateur draft.